Justice Minister: We will not sit with Gantz or join the Likud party. Justice Minister Ayelet Shaked accused the United Right of spreading lies about her and the New Right party. 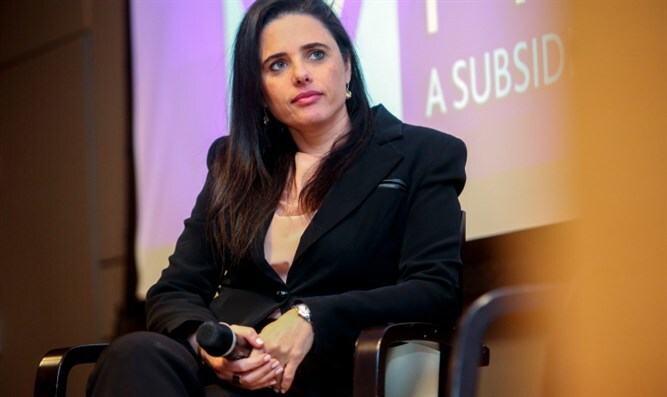 In an interview with Arutz Sheva, Shaked said "I very much hope that the Jewish Home and the right-wing parties will not degenerate into these areas." "Yesterday we sent two false messages against me in a very wide distribution. We will not sit with Benny Gantz and we will not go to the Likud, it's all a lie. I think that the election campaigns should be conducted in a way that maintains the purity of the elections," she said. Shaked stressed that there is no war over votes between the new right and the right-wing parties, and she hopes that the two parties will together receive well over 10 mandates. "We said that we would form a party that it is half religious and half secular and that our votes would come from more liberal right-wing and religious voters who in the past voted for Yesh Atid and may vote for Gantz this time. We never said we would not turn to religious Zionism." "Religious Zionism has never voted for the Jewish Home," she said. Religious Zionism is not eight seats, and we really succeed in bringing them in. I hope that by the elections the number of seats will grow and we will succeed in bringing in new audiences." Shaked also criticized Zehut leader Moshe Feiglin. "This is a difficult election campaign. There are a lot of parties. Feiglin takes votes from us from the younger religious Zionist voters. That is something I feel very sorry about. He does not see himself as part of the right-wing bloc and does not promise to join a right-wing government. He also presents illusions that have no basis in reality. The youth of religious Zionism must decide whether they are giving their vote to those who have been in politics for twenty years and have not managed to achieve anything, or to politicians with real accomplishments. I very much hope that we will receive a good number of Knesset seats and that together with the United Right we will reach a significant double-digit number." In response to claims made last week that the dismissal of Dr. Michael Ben-Ari by the High Court of Justice judges shows that her 'revolution' as the justice minister failed, Shaked replied: "Throughout the years of its rule, the Likud has not raised a finger to make changes in the judicial system. I am the only minister on the right that has changed things, and a change of [a system that has existed for] forty years is not being made in four years. The judges I appointed are young, so because of the issue of seniority, only one of them was in the expanded panel, David Mintz. This was all according to the law, In my personal opinion, Ben-Ari should not be disqualified. He was already an MK and nothing terrible happened." Shaked dismissed criticism of a video she appeared in in which she argued that her political opponents are closer to facism than she is. "I'm a strong independent woman, I made a very cynical and ironic film about the left that attacks me frequently about being a fascist, I think it's a strong video," she said.